Amber has planned a day to herself, full of things she loves, because tomorrow her entire world will change. Early into her adventure, she meets Cade, who is also on a mission to live this day to the fullest. Both hide secrets about what they're running away from, but it doesn't prevent their attraction from growing. When Amber and Cade finally open about their lives, they are able to see the possibilities that lie before them. 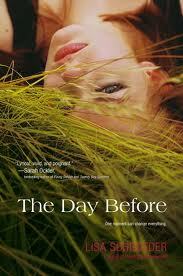 The Day Before is the third novel in verse that I have read by Lisa Schroeder, and the first that does not involve a dead boyfriend. I wonder if that was what was missing for me! While the book wasn't a complete wash, it was what I would consider "bathroom reading". It's entertaining to read as you brush your teeth and dry your hair; it's a book that is easy to put down, but you are happy to pick it back up. The Day Before doesn't leave a residue the way Schroeder's other books do. It isn't without merit; Amber is a likable protagonist and doesn't fit into the typical mold of a romantic heroine. Unfortunately, with only a day in her life, she isn't as developed as I would have liked. Schroeder develops both Amber and Cade's problems slowly, and it took me a long time to figure out what there problems were. It's always nice to be surprised. Still, this is a book for Lisa Schroeder's die-hard fans, of which there are many. Everybody else should stick to Chasing Brooklyn.